Waltham is a group of believers who place a great deal of emphasis upon mission. We take part in Habitat for Humanity, Public Action to Deliver Shelter, Illinois Valley Food Pantry and various other local projects. This year we hosted a Food Resource Bank event. Nationally, we are very supportive of the PC(USA) offerings as well as a supporter of Sunset Gap in Tennessee. Internationally, we take part in the partnership between Blackhawk Presbytery and Imenti Presbytery in Africa. But we also have a special relationship with Githiga Children's Home in Kenya and fully fund the teachers, staff and administrators there. Waltham is a community committed to responding to God's call to live out our faith both at home and abroad. We welcome you to become a part of our mission. Each year, we prepare over 250 Bunny Baskets for families in the Illinois Valley at Easter time. In 2014 we made 510. The event was again in conjunction with a Potluck. Milk jugs are cut into the shape of a bunny and filled with goodies. Left -- All these gallon milk jugs ready to become something better. Right -- Which ones get the yellow grass? The young and...mature join in to help. Hot melt gluing whiskers, ears and noses. Candy, chocolate and other treats are added to the milk jugs. Pink eared bunny baskets ready to deliver. 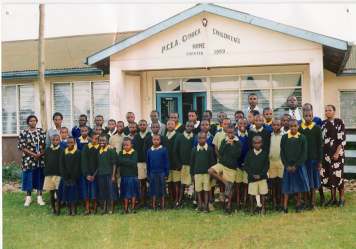 At right are the students and staff of the Githiga Home for Destitute Children, located in the Presbytery of East Africa in Kenya. Waltham Church provides direct salary support. At left is our booth at Utica's Burgoo Festival, an historic celebration of prairie stew. On October 27th, 2013, we hosted a harvest event for the Food Resource Bank, a Christian response to world hunger. Taking airm at six rows of corn. It's time to unload to a waiting truck.